A relaxing, soothing massage, which everyone can benefit from. It helps relax both body and mind giving you a sense of wellbeing. It helps relieve the general aches and pains caused from everyday life, leaving you completely relaxed & refreshed. 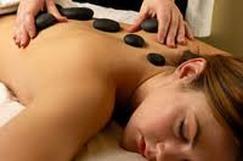 Hot stone massage uses Basalt stones which are made from hardened volcanic rock, carved and polished. They retain heat and glide smoothly against your skin when having a massage. The heat penetrates deep into the muscles aiding a deeper relaxation, de-stressing the muscles and mind, and increasing circulation. This massage can be concentrated on specific areas, or as a full body treatment. Acupressure is an ancient healing art which goes back thousands of years. The western treatment of trigger point therapy follows very closely to this. When specific points are pressed, it can help to release muscular tension, promote circulation of blood, and aid the body’s natural healing process giving you all the benefits of a massage. All this can be done either as part of a massage treatment or through clothing in a massage chair -with no oils needed.